House mouldings will help you transform your building project. The use of both interior and exterior mouldings will create a unique and impressive design. The Finishing Touch mouldings are aesthetically pleasing, light weight, easy to install and well within your budget. The beauty of Finishing Touch mouldings is that you can create unlimited designs mixing and matching from our extensive range. Whether you aspire to a French Provincial, Georgian, Mediterranean, Tuscan or Post Modern style for your build, the range available allows you to choose a combination of decorative mouldings that will create the look and quality finish you desire. . The automated manufacturing process means the Finishing Touch will deliver your mouldings with maximum speed, consistency and accuracy. From order to installation will take approximately four weeks. The lightweight mouldings delivered will be of the highest quality and at an affordable price. Our range of smooth finish mouldings are composed of an expanded polystyrene (EPS) core, reinforced with fibreglass mesh and coated with 1 or 2 coats of an impact resistant and flexible polymer modified cementitious render. The coating provides a smooth, durable exterior. Our range of sandstone finish mouldings are manufactured from computer cut high grade EPS polystyrene, triple coated with a multi-part compound then reinforced with a triple coating of sand for maximum strength and durability. Every piece of our decorative moulding range is carefully cast right here in Australia by our artisans in low maintenance high density polystyrene. This allows us to ensure tight quality control, on time delivery, and create the unmatched crispness of detail and high quality our customers and discriminating architects and builders have come to expect from the Finishing Touch range. Mouldings, once manufactured, are ready for painting at the build site, allowing the customer to select the appropriate colour and quality of paint. House mouldings in the modern home create an aesthetic, decorative statement. They have also served a practical purpose such as connecting different spaces within a building, such as wall surfaces to floors, window openings and doorways. Earlier mouldings were made of plaster, so crown and cornice mouldings were used to cover up inevitable cracking from the plasterwork between ceiling and wall, whilst adding a decorative finish. Chair rails and base mouldings protected walls from sliding chairs and other damage. Mouldings also became a status symbol, adding value to homes. They have also been used to denote the use of a room, such as decorative mouldings embellished with fruit motifs in the dining room. Today mouldings made by the Finishing Touch are lightweight and easy to install and are incorporated into the design of homes to create a particular period style or simply to add a decorative finish to a build. The Victorian style mouldings were richly detailed and elaborate. This architectural style points to the reign of Queen Victoria 1839 to 1900 and is commonly divided into Early Victorian (1840 to 1865) Mid-Victorian (1865 to 1880) and Late Victorian (1880 to 1900). Grand residences built during the Victorian period exuded affluence and were designed to express the social standing of the owner through both the size and detailed finishing of the home and reflected the progress and prosperity of England and her colonies. Mouldings of the Victorian era tended to be ornate with sumptuous detail. Door blocks were a common feature in Victorian architecture with many of the larger homes incorporating highly decorative two and three piece skirtings. From 1826 to the 1860 the architectural style in vogue was Georgian, overlapping into the Victorian era. This style is named after England’s four King Georges and draws heavily on classical influences. The Georgian style is known for its symmetry, formality, straight lines and fine detail with paired chimneys as well as a decorative “crowns” above the main entrance a common feature in buildings of this era. Georgian period mouldings are characterised by flat surfaces as well as simple, straight lines without curves. A glorious two storey Georgian style house of 50 squares has been decorated with architectural mouldings at Glen Street, Hawthorn. Eave mouldings (parapets) surround the perimeter of the house and window architraves add further decoration. Parapet mouldings at the front entrance, support the portico whilst stringers are 300-400mm below the parapet, on the first storey. Garage mouldings also add a stylish finish to this home, these are the same as window architraves. 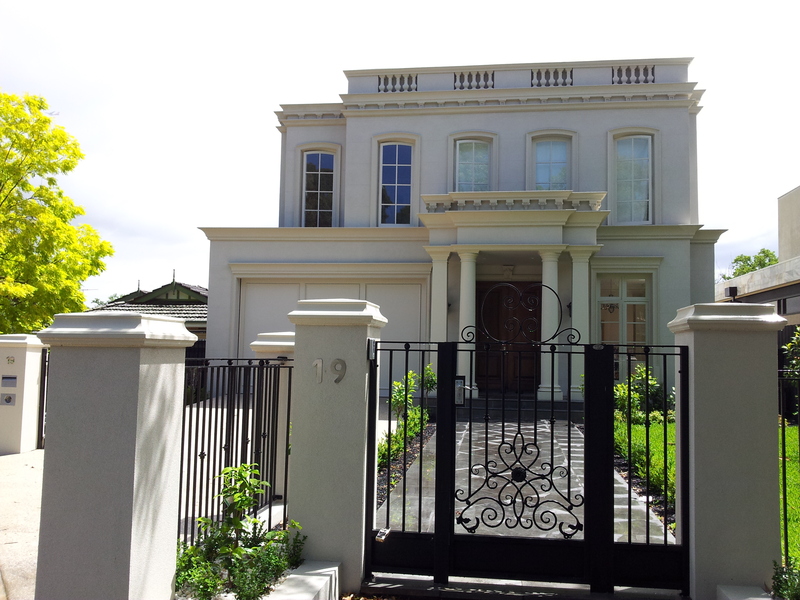 Columns always add a grand decorative statement to a building and a modern home being built in Sheffield Road, Montrose has used column mouldings from the Finishing Touch range. The four square columns are 200mm wide, creating a stylish façade. The capital dressing is achieved by installing a square column that has a column capital atop. A postmodern designed two storey house of approximately sixty squares in Jubilee Street, Mount Waverley has now had decorative mouldings installed. The architraves and window sill mouldings decorate all the windows around the house, on both the upper and lower storeys. A narrow stinger exterior moulding was installed, adding an interesting feature across the porch. A property in Henty Street, Balwyn has now had decorative mouldings installed on the upper level with exterior mouldings on the ground level being finished soon.